Saturday's European Rugby Champions Cup final match will be aired live on BT Sport, Sky Sports, beIN SPORTS and FR2 from the local time at the San Mamés Stadium in Bilbao, Spain of 17:45pm (CET), which is 4:45pm BST, 8:45am PT, 11:45pm ET and 1.45am in Australia early Sunday morning. 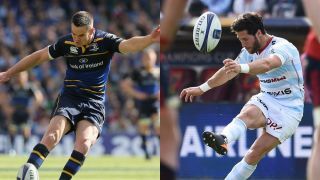 It's all come down to this - the European Rugby Champions Cup final will see Ireland's Leinster Rugby take on the French Racing 92 this Saturday May 12 in a final that could make the Irish club champions for a record-equalling fourth time. And you can live stream all the action...for FREE! After being defeated in the final in 2016 by Saracens, Racing 92 will be keen to take the trophy home this year. This would make them the fourth French club to win the European club game's blue riband tournament, and the first in the club's history. And this season's European Cup final has a bit of an Iberian twist - this is the first time it has been held outside of the usual European territories, heading to Bilbao in Northern Spain. It hasn't been since the 2010-11 European Cup pool stages when the teams last faced off - Leinster Rugby beat Racing 92 in two successive games. Key players to looks out for include Leinster Rugby forward, Scott Fardy who is having an impressive debut campaign, and forward Leone Nakarawa for Racing 92 with an awesome set of stats this season. Johnny Sexton, Leinster and Ireland fly-half, with his creative play and indomitable kicking game. To watch all the action read on to find out how you can enjoy the final where you are, wherever that may be. Live stream the European Cup final with our guide. Watch the European Rugby Champions Cup final from the comfort of your home this year with either Sky Sports Action or BT Sport 2 – yup, they're both airing the game, with coverage starting at 4pm BST on each. That means you can also enjoy it wherever you are using their apps Sky Go and BT Sport for smartphone, tablet and laptop viewing. Alternatively, NOW TV is a great way to try Sky Sports without paying for a huge contract commitment. It costs as little as £7.99 for a one day pass. If you don’t happen to live in a country where the rugby is being broadcast - or just want to stream the game for free - we've found a very clever way you can do so. Simply open the VPN app, hit 'choose location' and select the appropriate location - it's super easy to do. Choose a France locale to stream that free video. Click on this link any time from 4.45pm BST and you'll find the live stream of the European Cup final. And just because it's in French, that doesn't mean you have to cheer for Racing 92. And if you really get into the swing of things, the channel is live streaming the Eurovision Song Contest immediately afterwards, too. The European Rugby Champions Cup final will be streamed online via beIN Sports which you can watch online at the beIN Sports Connect page here. NBC Sports will also be broadcasting the game, for those that have access to that via either NBC, NBCSN or NBC Sports Gold. Either way, you'll need your cable details handy. Not got cable? Then there's always that free French feed as described above. Grab a VPN, follow the instructions and you'll be watching the rugby stateside in no time. The European Rugby Champions Cup final will be streamed online via beIN Sports which you can watch online at the beIN Sports Connect page here. Alternatively you can get access via the VPN options outlined above. As for Canada goes for Australia. The European Rugby Champions Cup final will be streamed online via beIN Sports which you can watch online at the beIN Sports Connect page here. Once again however, combine a VPN and france.tv for free action with a Gallic twist.